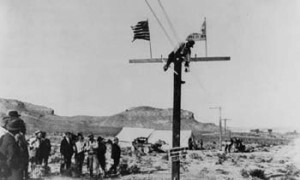 The first test call is made on the newly completed transcontinental telephone line, taking place between New York and San Francisco. The last pole was erected and the line completed two days earlier on July 27th, but commercial service did not start until January 25th of the next year. The sixth month delay was due to AT&T’s wish to publicize the service in conjunction with San Francisco’s 1915 World Fair.